Another week and another addition to the Steelers roster – welcome Anthony DeLuca, a forward that we hope will provide us with some offensive punch. Word on DeLuca is that he has what his admires call an “NHL Shot”. Let’s hope so, as goals still remain the Steelers Achilles’ heel. Last Saturday’s victory over Dundee was perhaps the best under new coach Tom Barrasso, it was a complete 60 minutes. The recent improvement in form is also being carried out with just three lines, once DeLuca and then another new signing (our 14th import) Tom will then be able to revert to four lines. The Barrasso way seems to be speed and intensity. That’s worked to date with limited numbers and limited offensive output. If we can add both numbers and firepower with DeLuca and one other then playing with the same intensity using four lines could be an exciting proposition. News yesterday was that the Steelers would play Guildford Flames in the Challenge Cup quarter finals. The draw was interesting and I love the new format. The clubs are as always seeded 1-8 but rather than 1 vs 8, 2 vs 7 etc the top seeds get to chose their opponents for the knockout stages. It was obvious that the number 1 seed, Belfast would select Dundee. I also predicated that 2nd seeded Cardiff would travel to Glasgow to take on the Clan. Nottingham then had the dilemma, Manchester or Sheffield. Let’s face it, they bottled it didn’t they? Everything was telling them to take Sheffield, the pay day, the event and the chance to knock the Steelers out. However they went for Manchester, they weren’t confident enough to take the Steelers, imagine after selecting us and being knocked out by us. Their confidence wasn’t enough to offset against the embarrassment of being booted out of the completion by the Steelers. We must be improving. They were scared of us weren’t they? 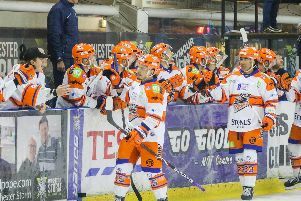 The Steelers will get a good luck at their cup opponents this Saturday at the Arena in league action. The Guildford Flames are perhaps the fastest and most exciting offensive side in the league. Players that can score from anywhere. A game between the Steelers and Flames will be end to end. Guildford won’t “Park the Bus” that’s for sure, they can’t. They don’t know how to play that way. It’s put the bus in top gear and put the pedal to the metal with Paul Dixon and his side. It will be exciting and entertaining that’s for sure. The Flames are the next side. By that I mean after the four big Arena clubs they have taken the position of the next big side. Strong on and off the ice, well run, well coached, a proper good club. Tom Barrasso said last weekend that Jackson Whistle would start Saturday’s game. “He is winning and we will ride him,” said the boss. So no sign of Matt Climie between the pipes on Saturday, though who knows in Dundee on Sunday. With only a maximum of 13 imports available to Barrasso maybe the new goalie will dress and back up. I guess you will have to be there to see what happens. Quick reminder for you, I’ve been recording some radio adverts this week and it came up that we are having our Teddy Bear Toss at the game on Saturday 15th December vs Coventry Blaze. Hallam FM’s “Mission Christmas” will benefit from all the toys as we try and make sure that every child in and around Sheffield has a gift at Christmas. Let’s make our Teddy Bear Toss this year the biggest and best we have ever organised. See you at the Arena on Saturday, 7pm vs Guildford. Let’s go Steelers.